If you’re anything like us here at Branding Personality, you can’t wait to park yourself in front of the TV this Sunday to watch the huge matchup between the Broncos and the Seahawks. Hmm…on second thought, maybe it’s just Michael and I who are supremely stoked to see our favorite teams battle it out for the coveted Super Bowl championship title. Over the past five years, the Super Bowl has drastically changed the proverbial playing field of real-time marketing. With the arrival of social media, marketers have revolutionized the way fans can interact with their favorite teams in the days and weeks leading up to the big game. And this year, I give two thumbs up to Verizon Wireless for curating one of the most highly creative Super Bowl marketing campaigns to date. On Monday, Verizon launched the first ever social media powered light show on the Empire State Building – Uhhh, can we just pause for a moment to say how seriously AWESOME that is?! 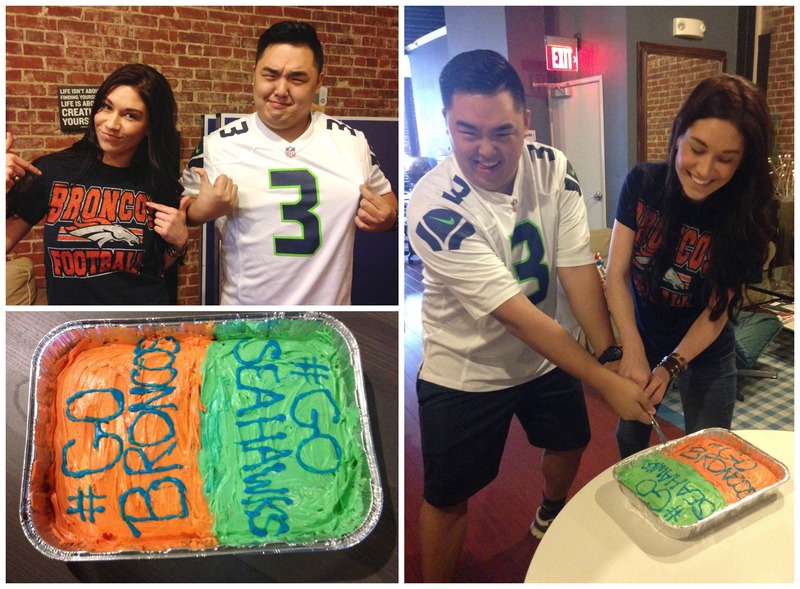 – and zealous Broncos and Seahawks fans immediately jumped on board. Can you blame them? Since the NFC and AFC champs were crowned, Verizon has been monitoring all tweets related to the Super Bowl. Then, on Monday, Verizon began posting daily game-related questions to fans on Twitter using the hashtag #WhosGonnaWin. Every day, Verizon then scores each team from 0-100 based on the number of tweets from fans; the team closest to 100% of positive mentions that day lights up the Empire State Building in their team colors at 7pm. Which leaves tonight’s big question: “Who’s gonna win Super Bowl XLVIII? So what’s it gonna be? #WhosGonnaWin Super Bowl XLVIII this Sunday? Only time will tell. Until then…tweet your heart out to @VerizonWireless and tell them who’s the boss! Light ’em up, up, up!